I’ve been given the task of writing my biography – and it is due today. Not nearly enough time to write the book that I’ve been meaning to write for years – so I needed to figure out how to approach the problem of writing a biography. This has brought me back to reading The Wounded Storyteller by Arthur W. Frank. The story is wrecked because its present is not what the past was supposed to lead up to, and the future is scarcely thinkable. (p.55). Because the present of illness is not what was planned in the past, reestablishing the connection of past to present may require an exercise in what psychoanalyst Donald Spence calls narrative truth. Spence and Carr agree that the past cannot be reinvented, but the sense of what was foreground and background in the past events can shift to re-create a past that Spence calls “greater continuity and closure.” Out of narrative truths a sense of coherence can be restored. (p.61). I think this is in part what is causing me to stumble on getting started. The past doesn’t make sense given the present. I cannot simply look back at my past and see it the same way I did before cancer. The illness itself changes the reflections on the past. Events that I would have forgotten are much easier to recall. Events that I thought were important before are now forgotten. There is no way for me to look at my past through the innocent eyes of someone who has never been touched by cancer. We need to tell someone else a story that describes our experience because the process of creating a story also creates the memory structure that we’ll contain the gist of the story for the rest of our lives. (p. 61). This causes an interesting reflection. In the beginning – right after my initial diagnoses and perhaps even in that time while I was waiting – I needed to tell my story. I started my blog right away. I recall the feelings of impostor syndrome while I was waiting for the pathology. What would I do with my narrative if it wasn’t cancer? Was I overreacting? Would I be that person on the Internet who was seen as a faker because I didn’t actually have cancer? These thoughts all rang through my mind. I started to write about impostor syndrome and as I was writing the post the phone rang. It was my surgeon confirming the pathology. I was no longer an impostor. I had cancer. “I love you would say it in these words, the teller of the illness story seeks to learn the true name of the disease, and perhaps her own true name is well.” (p. 75-76). “Contemporary culture treats health as the normal condition that people ought to have restored. The ill persons own desire for restitution is compounded by the expectation that other people want to hear restitution stories.” (p.77). “Ill people who tell restitution stories practice their own banality of hero wisdom. They lived out illness as a matter of doing their jobs as patients, preparing for the future after illness, and getting through their own days.” (p.93). “Chaos is the opposite of restitution: its plot imagine life never getting better.” (p.97). I wondered what type of narrative my story should be? I’m not certain it is a single narrative – rather it is a composite of all of them. The immediacy of some of my blog posts, and the suffering in the moment reflects illness as chaos narrative. And yet, much of my outlook on life has been optimistic. I want to believe the restitution narrative. I want to believe that “health is a normal condition that people ought to have restored” (Frank, 2013, p.77). I have told many people that through treatment I looked at doing exercise as part of my ‘job’. I prioritized it over anything else that might have looked like work. My days were filled with doctors appointments, infusions, and exercise. I was the professional patient. The chaos plot is the one I tell myself when I haven’t slept enough and I begin the downward spiral into anxiety and depression. It is the the sense of hopelessness I feel until I realize that, alas, it is just that I am over-tired. Sleep usually helps me pull myself out of the chaos narrative. I also think that blogs can be a good way, if there is such a thing, to tell the chaos story. It is a way to tell the raw happenings as they happen. This idea of an chaos story has me wondering if Nancy’s recent memoir is a chaos narrative, as the title certainly suggests it Cancer was not a gift & it didn’t make me a better person by Nancy Stordahl. Perhaps it is even the sense of chaos narrative in the title that makes me not want to read it (sorry Nancy). Frank’s comment about how “Chaos stories are also hard to hear because they are too threatening. The anxiety these stories provoke inhibits hearing.” (p.97-98) aligns with exactly how I feel at reading the title. I’m not sure I want the anxiety associated with the telling of the chaos narrative. This quote reminds me of another friend – Scott – who often leaves comments on my blogs. His story of chaos has not been honored by his ‘care team’, and as a result, he is not a recipient of empathetic care. The more I read about quest stories, the more I realize that is my story. I feel comfortable using the term “journey” to describe my way through illness. It is a narrative that I embraced from the beginning. In only my third blog post (at that point I was writing more than one post in a day), I talked about advice from a friend who suggested that “one approach is to treat the disease with curiosity”. This was an attitude that I fully embraced. I sought to document my journey through illness. At times the chaos narrative was present. At other times the restitution narrative was present. But throughout, there was always the underlying story as journey. Frank also mentions that published illness stories are most frequently quest narratives. He also highlights that there are many quest narratives that are not published, but are rather enacted in life. “Involvement in patient advocacy is one enactment of a quest story” (Frank, 2013, p. 116). My friend Stacey‘s advocacy story is an example of a story that is mostly untold in narrative form, but is enacted in her every-day life. This in part is my new PhD journey. My new study will look at the different learnings that occur through blogging. 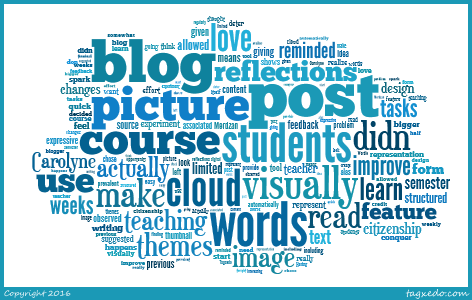 I will be reflecting on my blog, as the narrative of my research unfolds. I will be asking other breast cancer bloggers, as well as those who read breast cancer blogs, to come along for the ride. I will need others to be active participants in my journey towards better understanding of my illness experience. I will write a patching together of stories. 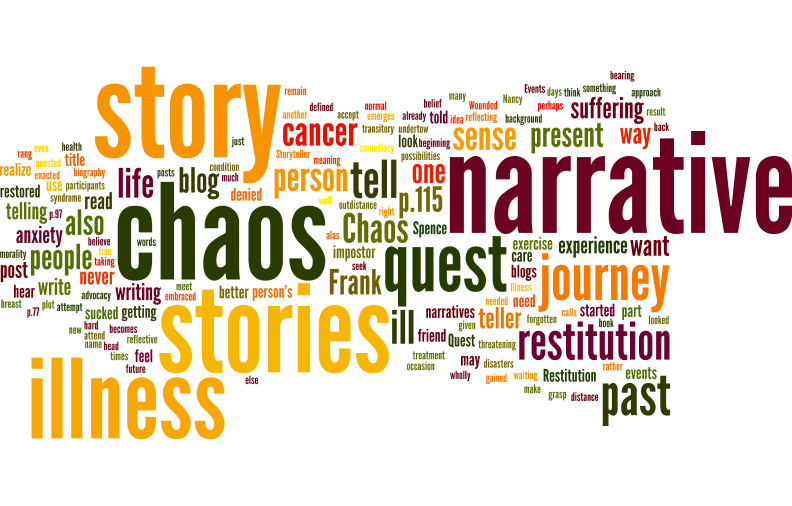 As I read more of The Wounded Storyteller, I realize that I have several other blog posts just about quest narratives. I’m finding myself highlighting passage after passage – such that most of the pages in that section of the book are reflecting the fluorescent yellow that I use to highlight. But alas, that is a blog post for another day. This one is already long.